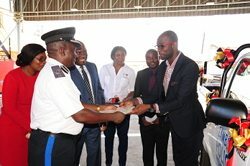 CEC once again lived up to its reputation as a responsible corporate citizen when it gave a motor vehicle valued at K90,000 to the Zambia Police Service on 9th March 2017 at a ceremony held at the Company’s Head Office in Kitwe. The donation was in response to a request by Garneton Police Station which had been operating without a vehicle for some time, making efficient service delivery challenging. Managing Director, Owen Silavwe, said the contribution was made with a common understanding that a well-resourced police service was best placed to maintain law and order in the community. He stressed that crime prevention and maintenance of public peace and order was a daunting task requiring a lot of resources; with transport being key in aiding efficient mobility and improved operations. 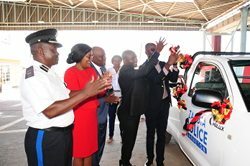 Silavwe said CEC attached great importance to public safety and security and, therefore, found the Zambia Police Service a key partner in advancing the cause. Hence, the Company’s continued partnership with the institution. Zambia Police Service Officer Commanding for Kitwe, Edwin Chisi, lauded CEC’s action, disclosing that the police station had been operating under difficult conditions. He explained that said there being no police camp in the vicinity, mobility for the officers working at the station was a daily challenge, particularly in the rainy season. And Chimwemwe Member of Parliament, Mwila Mutale, said his constituency had experienced rampant cases of vandalism and theft of private and public property, leaving residents and investors vulnerable and in constant fear of attack. He said the area boasted a lot of investment opportunities such as the Chambishi Multi-Facility Zone currently under development, thus, requiring efficient police services. Ichimpe Ward Councillor, Mpasa Mwaya said, through its continuous support to the Zambia Police Service, CEC had demonstrated its clear resolve to contribute to the creation of safe and secure societies. 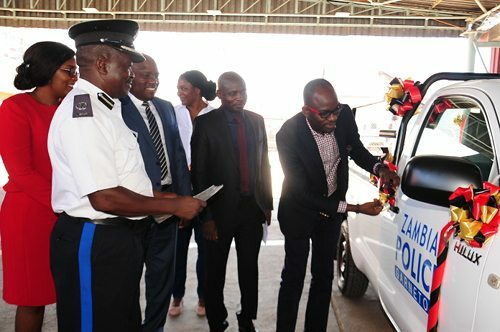 Kitwe District Commissioner, Binwell Mpundu implored the Police to put the resource to good use so as to instil confidence in the corporates that the support rendered was worthwhile. Mpundu said Kitwe District had experienced rampant crime and hoped that the resourcing of the police station would in a way contribute to containing the situation. He said CEC’s laudable gesture was a practical way of how the private sector could supplement Government programmes aimed at advancing social and economic development.